Who could forget that bit in 1990's Goodfellas, when the boys cook a gourmet Italian meal in their swanky prison cell... complete with wine, artisan-grown tomatoes, and hand-peeled garlic? As it turns out, Al Capone's prison cell (that is, the Al Capone cell at Eastern State Penitentiary; the mobster was imprisoned several times) was almost as swanky. And it was certainly nicer than many of the tiny, bedbug-infested holes that are increasingly going for top dollar all over Manhattan, Brooklyn, and the like. What was Capone's jail cell like? Pictures of it feature luxurious oriental rugs, expensive antique armoires, exquisite lamps, and a decidedly hip decor – something akin to one of those novelty B&Bs that are built into the side of a cave. After Capone was released from Eastern State after serving a six-month sentence, he spent time in the Atlanta U.S. Penitentiary, and then later in Alcatraz, where he rapidly deteriorated due to the ravages of syphilis. Nevertheless, for a while, America's most memorable mobster lived a more than charmed life – even while incarcerated. 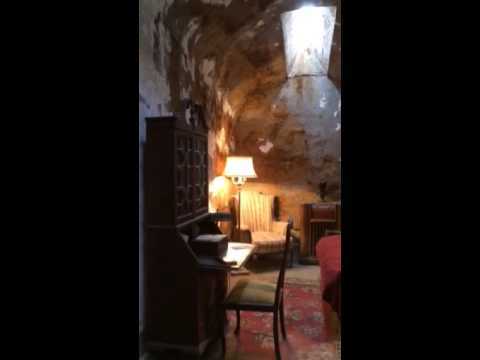 It Resembled The Swanky Cell In "Goodfellas"
At Eastern State, Capone's cell was strongly reminiscent of the infamously cozy and luxuriously furnished pad in Goodfellas. (Director Martin Scorsese was said to have partially based said scenes on Capone's lodgings, in fact). According to the Eastern State website, Chicago's premiere crime boss was indeed allowed "comforts not typically granted to inmates." (No word on whether or not the jail cuisine was as gourmet as that in Goodfellas, but with Capone's money, it seems likely). Despite the fact that authorities emphatically denied giving certain inmates preferential treatment, it was an open secret that Capone's cell was situated on what was called the “Park Avenue Block," an area of the prison that was (very) un-officially reserved for prisoners with fat bank accounts. In addition to the lush plants that gave the cell an exotic "tropical greenhouse" look, Capone had two skylights in the roof of his lodgings. Granted, it was nothing like Capone's famous Scarface-esque Miami Beach mansion, which sold for $8.45 million in 2014. (You can take a video tour of said residence above). Nevertheless, the Eastern State cell did have a fabulously groovy retro look to it – one that was strongly evocative of a Tiki bar, complete with a reddish, flickering ambient glow and an exotic Polynesian vibe. To look closely at Capone's meticulously preserved cell (Eastern State has since been turned into a museum and historical site), is to gawk at luxury in spite of its outer surroundings. On one desk sits an antique fringed lamp – the kind that would have been right at home in any well-heeled Victorian home. On the other side of the room, there's a beautiful hand-carved writing desk, complete with an elegant cut-glass cabinet. (Martha Stewart's cell itself would have been envious).